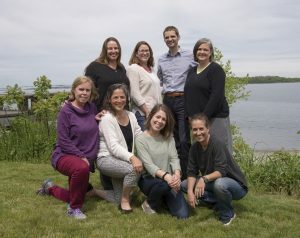 CRC staff and students, along with partners, who participated in the creation of PREP-RI – Providing Resilience Planning in Rhode Island — are all smiles as the online education program, a six-module series regarding how to prepare for flooding and erosion tied to strong storms and sea level rise, is a 2017 recipient of a American Planning Association/Rhode Island Chapter Award for Current Topic. PREP-RI (http://prep-ri.seagrant.gso.uri.edu/) is an online education program representing a critical step forward for Rhode Island coastal preparedness and resiliency planning. The program answers the request of coastal community officials, decision-makers and others engaged in public policy for community resilience education. It also serves as a program to address recently passed state legislation requiring planning boards and commissions to have training on sea rise and flooding. The education is necessary so this targeted audience can implement wise, science-informed policies and practices to address the impacts of flooding from rising seas and more intense storms, key aspects of climate change. Significantly, it marks the first time that the Rhode Island Legislature has funded a University of Rhode Island (URI) based effort to address pressing public planning needs concerning resiliency education and training. PREP-RI is tailored to the needs of its decision-maker audience; it respects and builds upon the solid core of state and local expertise in coastal community adaptation policy and practice, and has been designed as an online Rhode Island based experience that enables participants to engage on their own schedules. The program, was launched as a pilot in June 2017, and is now the subject of an outreach effort focused on providing training to Rhode Island’s communities, with an initial focus on the 21 coastal communities. Positive feedback from users reflect its practical approach, keen interest in local examples, accessibility in language and brevity, and its online availability. PREP-RI is part of a package of tools that is being used for a companion face-to-face component designed to help municipalities incorporate resiliency information into local planning initiatives. PREP-RI has had the effect of building momentum within the Rhode Island coastal community planning arena for additional resiliency education and training; it also supports State initiatives to incorporate climate change in Comprehensive Plans, engage agencies in the Executive Climate Change Coordinating Committee, and develop a statewide Resilience Strategy, as shared recently in the Governor’s Executive Order.